Rarely has a generation spawned such a cottage industry of profiling. The largest and most diverse generation in American history, millennials are also the most contradictory, sparking endless intrigue, analysis and caricature. They’re at once idealistic and anxious, wholesome and distrustful. They consistently clamor for meaning and community while the polls show an unprecedented exile from the institutions (e.g. marriage and religion) that traditionally offered both. They’re the most educated and socially conscious generation to date, and yet with the help of social media, millennials are being driven to unprecedented levels of anxiety and loneliness. How does all this play out in the housing market? As millennials come of age and the older tier in particular begins to settle down, there are four key trends worth noting. The first is that, for millennials, dollars have replaced relationships as the primary basis for security. The second is that they are leaving big and established coastal cities for smaller and reviving inland cities. The third is that many increasingly prefer to live in hybrid arrangements that integrate one’s life, work and play, which, along with costs, may explain the revived embrace of suburban amenities, albeit in fresh forms. And the fourth is that while this generation is less mobile than previous generations, there is a crucial divide between millennials who have agency to follow their desires – who some call the “supermobile” – and those who don’t. 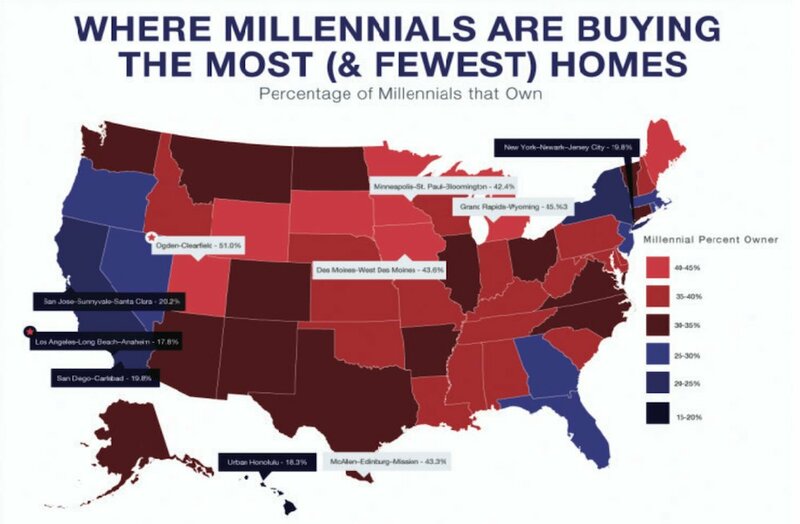 Editor's Note: If you are a millennial and home ownership is important, don't be afraid to move.